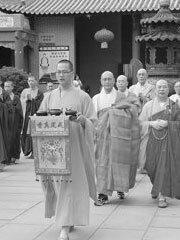 The Chogye Order (曹溪) is a monastic order of Zen Buddhism and serves as the largest denomination of Buddhism in Korea. The Kwan Um School of Zen, founded by Zen master Seung Sahn, is a Western off-shoot from the Chogye Order. According to 1994 statistics, has 1,725 ​​monasteries, 10,056 monks and 9,125,991 followers.